She cleared her throat and leaned forward to set her untouched sherry on the table, but his hand shot out to close around her wrist. Her breath stalled as he slid his fingers down to cover hers, gently plucking the glass from her hand. He set it down for her, and his own as well, but he didn’t lean back. The scent of his bay rum tickled her nose, and she was close enough to see the faint dark stubble beginning to form on his jaw. Surely, this close to her, he could hear her heart pounding. His hand found her wrist again and he traced his way up to her elbow, curling his fingers around her upper arm. She burned everywhere he touched. She should get up and leave. His intentions were clear and the longer she sat here, the more awkward it would become. The moment for decision was past as he slid his hand back into her hair, holding her head gently between his palms. She wanted to push him away and flee, but she couldn’t seem to make herself move, not when he was so close, staring into her eyes this way. She was stunned into silence, absorbing his words. Staying. Invading. This was her place and he was forcing his way into it, asking her for the impossible. And that was when she finally found the wherewithal to move. A Duchess in name by Amanda Weaver is an historical romance novel set during the Industrial Revolution where rail and sea travel was just as common and flight is today. This story introduced us to Victoria Carson, an American heiress, who family had all the money they could ever want for, but was missing the esteem title has they had moved from New York to London. Oh what a joy it would be for her mother to finally be an actual part of London’s High Society with the prestige that their money could not even buy. On the other hand there is Andrew Connelly, Earl of Dunnely, who has the title, the unconventional pedigree, whose parents lacked the coins, business sense, and couth to sustain the family at their very basic of needs. During one fateful hand and at the place where gentlemen go to shoot the breeze, Victoria’s father makes her mother’s dream come true by winning a man of great title for their American princess to marry, Victoria. Now, little Miss Carson is all too thrilled, because she sees this as an out from under the thumb of her social climbing parents, but Andrew sees this as the worst thing that could have happened to him, yet the best thing that could have happened for his sisters. You see, his family is broke, his ‘dad’ is a drunk, and his mom is a THOT, so his newly found wealth is only for the benefit of his sisters and he will be off to Italy to continue his archaeological dig and his sweet thang that is waiting for him. All that changes the minute he sets eyes on Victoria and she in turn is all game because is hot.org. There is an instant chemistry and the sparks are lighting up the sky. But then there is another twist that send these two into oblivion...like for real into the middle of nowhere and quickly the story goes from Victoria together forever with Andrew to a story about Victoria an HGTV reality series about London countryside fixer-uppers followed by Andrew and his archaeological dig and his Italian love affair. Circumstances change and one thing leads to another or two or three and bingo bango the truth finally comes out after nearly two years of being married, and since this is a romance novel, which indicates a happily ever after, Victoria and Andrew finally become each other’s everything. Overall, I would rate this read 5-stars. I mean, I thought about and could not think of any other rating that would fits this incredible story. This novel was well-written, well-paced, and had a certain realness unlike other historical romance novels you may encountered. 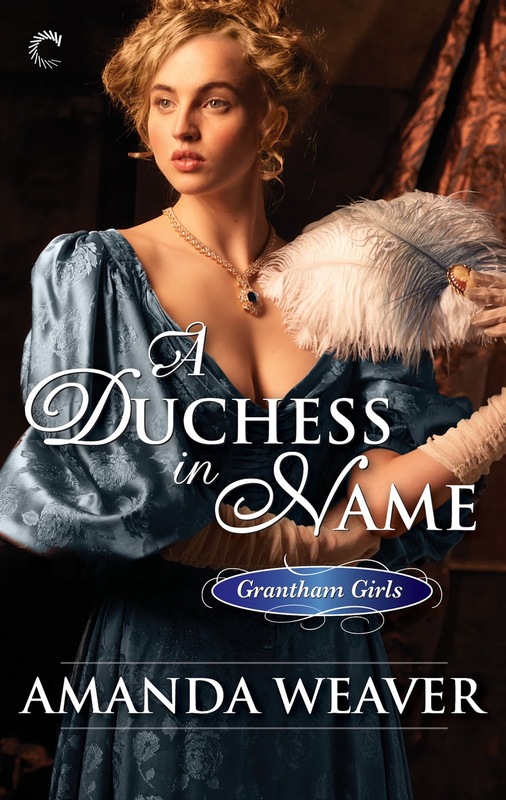 Even with the expected ending, the events that lead up to that beautiful conclusion is worth me recommending that you run and read, A Duchess in Name, because this is a good read that will not leave you disappointed. I'm so glad you liked it! Thanks for reviewing! You are so welcome! Thank you for sharing Victoria and Andrew's story!! !